Remember when we used to do 5 Things Thursday? With a theme and everything? I mean, aqua shoelaces + dots? Um, yes please. However, when I tried to track them down, I discovered that they were completely sold out online, which means I’m not the only one who thinks they’re cute. But it got me thinking, if this polka dot enthusiast can do Thrifted or Grifted posts about them and even paint her washer and dryer with them, why not incorporate them into my fitness wardrobe? So, I did a little poking around the internets and came up with these other four options (which, when combined with the shoes = a throwback to 5 Things Thursday!) that you can buy that I would happily wear to the gym or even just out and about in some cases. 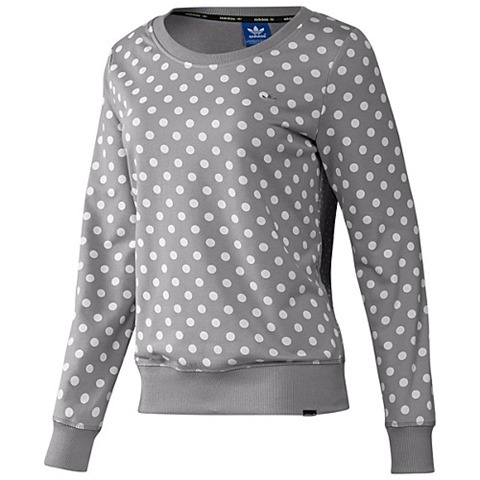 First up, this Adidas pullover combines my love of polka dots with my love of gray sweatshirts (are you surprised considering my penchant for all things colorful? Well, now you know: I looooove gray). It’s on sale for $39 (down from $65), which is definitely on the pricey side, but during chilly seasons, I could see myself throwing this on over my teaching top every single time, so maaaaaaybe I could justify it with that whole “low price per wear” argument. Next up, I’m seriously considering getting this Reebok Run Dot Sports Bra. I’m a Reebok One member, which gives me 25% off all apparel + free shipping and returns, but even with that, this bra would still cost $23-ish. Not horrific, but not crazy cheap either. Still, I really like the idea of its adding a pop of fun/pattern as it peeks out from under the almost exclusively black tops I wear every single week to teach. I also like the fact that it’s not low-cut (full coverage sports bras are getting harder and hard to find) and that it has multi-colored straps in the back. Next up is this Nike Knockout SJ Tank. I love it in this turquoise color, but in reality, the only one I can find in stock is a fuchsia and turquoise option that I don’t like quiiiiite as much, but it’s still pretty darn cute. And lastly, and honestly, pretty much leastly, we have these crazy-town Adidas leggings. Let me be clear that I am NOT a member of the “leggings are pants” party. 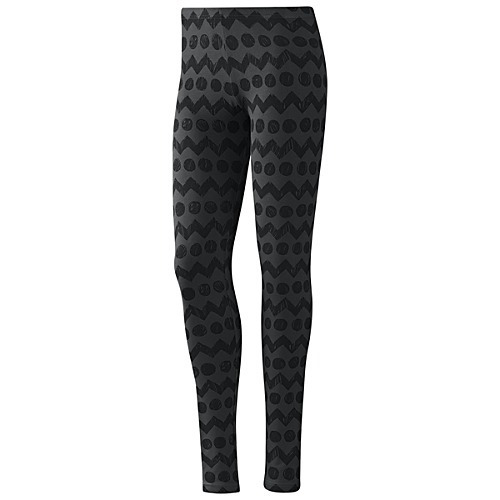 However, I think these under a pair of running shorts in the winter would be a nice change of pace from your basic boring black (question: why do I keep thinking, “Flintstones?”). 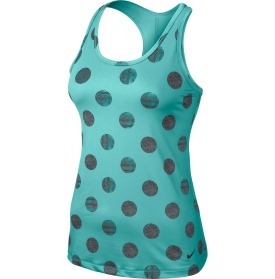 So, what do you think about polka dots + workout wear? Fun, or too twee for a sweat- fest? P.S. 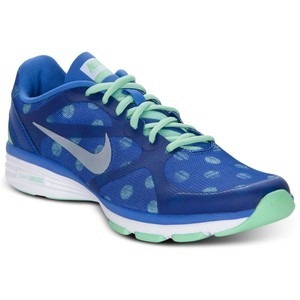 If you find those purple/aqua Nike polka dot shoes in stock somewhere, I’m a size 9.5 (hello, Bigfoot, I know). Please and thank you. If yesterday’s post was an ode to the triumph of stumbling upon something you’ve been stalking for a while, today’s is all about the hunt. So, what am I after now? I keep talking about how I’m not trendy, but there are certain aspects of certain trends that definitely speak to me (harem pants never utter a single word). And the whole military look, with its brass buttons and olive green and general air of tough femininity…yeah. Me likey. I’ve been hoping to blunder into a really great military jacket deal but haven’t had any such luck so far, so in lieu of being able to show you the real deal, here are five that I would snap up in a heartbeat…at least if I found them at Goodwill. This Cotton Cargo Jacket is actually in the “big girls” section (question: if one is old enough to qualify as a “big girl,” wouldn’t one rather not be referred to as such? ), but the reviews indicate that adults are buying it as often as not, and Nordstrom offers free shipping and free returns, so trying it on is a definite possibility (oxymoron, I know; but I like the phrase). This juniors version (also from Nordstrom) is cute too, if considerably less clean-cut. I’m a sucker for anything with a hood, and I think this version is adorbs. And it’s actually from the women’s department, which is good since it might not be best for an almost 31-year-old woman (1 and a 1/2 weeks…sniff, sniff) to buy too many things from the “big girls” and juniors departments. Trust J. Crew (Factory, actually) to have something I love …for way too much money (not that it matters since it’s sold out). This one’s a bit of a departure from the rest, but I wouldn’t say no to something ruffly and all buttoned up if it looked like this. So, what do you think of military jackets? Do they pass muster for you? (Sorry; I had to go there). And which style do you think I should go for? Tailored and pretty or casual? Did you have a favorite? Or a link to one you love? Do tell!